"What exactly is radiant energy?" Hold your hand over a hot cup of coffee and feel the heat. The logical conclusion is that heat rises. Logical maybe, but incorrect! "Hot air" rises but "heat" can travel in any direction. That is why you can feel the heat of the cup when you place your hand to the side of it. Radiant energy transfer is caused by a warm surface giving up its heat to a cooler surface. Whenever there is a temperature difference between two surfaces, both surfaces will attempt to equalize. Radiant energy travels through space without heating the space itself. It only turns into heat when it contacts a cooler surface. Our human comfort relies just as much on radiant heat transfer as it does on air temperature, yet the majority of heating and air-conditioning professionals think only in terms of air temperature. As a result, Americans are missing out on a truly comfortable living environment in their own homes or places of business. By controlling both the air temperature and the radiant transfer, radiant panel systems deliver a comfort that is unsurpassed. A radiant panel can be effectively mounted on any flat surface. The only requirement is the surface be sufficiently large enough. The larger the surface, the lower the actual surface temperature required. A wall radiator may have a surface temperature of 180^0F while an 81^0F floor will do the same job. Radiant energy will heat the surfaces of all objects which are in direct line of sight from the panel; that means all walls, floors, ceilings, chairs, tables, or people which can be "seen" by the radiant panel. Therefore, a heated ceiling will raise the surface temperature of floors and walls, while heated floors will raise the temperature of ceilings and walls. Air coming in contact with these surfaces is also gently heated. Skin surface temperature, about 85^0F, is generally warmer than the surrounding surfaces. This makes us a radiant panel. Stand by a large picture window in midwinter and you will feel the heat leaving your body. If the rate at which we radiate heat is correct, we feel comfortable. When the temperature difference between our body and the surrounding cool surfaces becomes too great, we have to put on a sweater to slow down the rate at which we are radiating. When the sun beats down on us through the window, we receive heat instead, and off comes the sweater. Our normal state is to lose heat at a constant and regulated rate. We are also designed to lose heat in other ways as well. Air coming in contact with our skin conducts away heat. Our skin is moist and moving air also causes evaporative cooling. A truly comfortable environment is one designed to draw heat away from our bodies at precisely the correct rate. A heated floor normally "feels" neutral. Its surface temperature is usually less than our body temperature, although the overall sensation is one of comfort. Only on very cold days when the floor is called on for maximum output will it actually "feel" warm. Heat coming from a wall radiator can be felt the closer you get to it because its surface is much warmer than your body. Radiant ceiling panels are also generally warmer than your body so you will feel some warmth on your head and shoulders. All these radiant systems are designed to match the heat loss of the human body in a way not possible by any other form of heating. Any of these radiant experiences are far more pleasant than being buffeted by the hot-then-cool breezes which are often associated with a forced air furnace. Whether your choice is floor, wall or ceiling panels, they are heated in one of three ways: water pipes, electric elements or air channels embedded in the panel. Of these three, air is seldom used, leaving electric circuits and water pipes (or channels) as the most prevalent. Electric panels have electricity as their sole utility, are quite simple in construction and generally have a lower 'up-front' cost. Water, on the other hand, can be heated by almost any utility be it natural gas, propane, oil, wood, solar, or electricity, and is quite versatile. Your choice will probably hinge on the energy costs of the available utility and the size of the project. What makes WIRSBO Pex tubing so special? PEX is an acronym for cross-linked polyethylene. The "PE" refers to the raw material used to make PEX (Polyethylene), and the "X" refers to the cross-linking of the polyethylene across its molecular chains. The molecular chains are linked into a three dimensional network that makes PEX remarkably durable within a wide range of temperatures and pressures. The PEX tubing is cross-linked to insure uniform structural integrity and a lifespan of over 200 years. It contains an integral oxygen diffusion barrier on the pipe that is critical to preventing corrosion within the system from the aggressive nature of free oxygen molecules that can readily destroy other types of radiant tubing on the market. We have installed over 1,000 miles of PEX tubing and are convinced the difference in quality is well worth the extra cost over polybutylene (PB) tubing, rubber tubing and tubing cross-linked by the Silane method. The tubing is either installed in the slab of the main concrete pour or stabled to a plywood subfloor and covered with 1 1/2" of Gypcrete, a lightweight concrete aggregate. It can also be stapled to the underside of floor joists in retrofit installations. The in-slab method has advantages in conductivity, cost, and ease of installation. We have a fool-proof method for installing hardwood floors over the Gypcrete radiant slab. There are several methods used to cross-link polyethylene. These methods produce products with very different properties. A distinction should be made between PEX produced above the crystal melting temperature ("hot" cross-linking), and PEX produced below the crystal melting temperature ("cold" cross-linking). Simply stated, there's a difference between PEX cross-linked during the manufacturing process and PEX cross-linked as a secondary process. Wirsbo PEX tubing is made using the Engel method. The Engel method is a "hot" cross-linking process, meaning the actual cross-linking takes place during the extrusion process when the base polyethylene is above its crystal melting temperature. Engel method PEX is classified within the industry as PEX-A tubing. The Engel method provides more precise control over the degree, consistency and uniformity of cross-linking. This means the tubing is evenly cross-linked, with no weak links within its molecular chains. Another common cross-linking process is the Electronic or Radiation method (known as PEX-C). In this method, high density polyethylene (HDPE) tubing is extruded. Then, in a secondary process, the tubing is treated with high voltages of electricity. This changes the molecular structure of the polyethylene into a cross-linked network. However, since the electronic method is a "cold" cross-linking process (the material is below the crystal melting point), it produces a lower level of cross-linking than the Engel method. In addition, the Electronic method can produce a less consistent level of cross-linking. A third common cross-linking process is the Silante method (or PEX-B). This, too, is a cold cross-linking process. A special, pre-mixed polyethylene based resin is extruded into HDPE tubing. In a secondary process, the tubing is placed in a sauna to complete the cross-linking, with more complicated bonds across the tubing's molecular chains. A simple wall thermostat is generally all that is required. Working in the background may be an "weather sensitive control" which adjusts the panel temperature based on the outdoor temperature for increased comfort and economy. A big advantage is the option of a thermostat in every room. This provides additional comfort as well as energy savings because you can turn down those rooms that are not in use or that you prefer to have cooler. Keep in mind additional features like these also increase the cost just like adding power windows and locks to the sticker price of an automobile. But unlike automobile options, these comfort features will pay back in energy savings. What makes tekmar controls so special? The technology available today allows us to fire the boiler and control or modulate the boiler water temperatures based on outdoor temperatures. This device is called an Outdoor Reset Control and becomes the 'brains' of the boiler system. The microprocessor has sensors attached to the vital components of the system and to the outside of the building, constantly processing all data to keep the system running at maximum efficiency depending on how cold it is outside. When it gets warmer outside, the boiler water gets cooler...as it gets colder outside, the boiler water gets hotter....The device is manufactured by tekmar and we use it on most installations. This control brings sanity and savings to any hydronic system because it matches heat input to heat loss at any given moment. It also gives priority to recovering the tank of domestic hot water in the indirect-fired hot water heater. The tekmar control is part of every radiant floor system we install. The tekmar control strategy can save an additional 15% to 25% of the yearly energy costs of operating the boiler. No boiler system should be installed without it. Panels come factory assembled or constructed on site. They can be surface mounted on floors, walls or ceilings or embedded. Wall and ceiling panels generally come pre-assembled and are primarily metal with a decorative surface. Floor panels are usually part of the floor construction. They consist of electric cable or warm water tubes embedded in or attached to the floor. The cable or tubes may be buried in a concrete slab, covered with concrete or gypsum on a wood subfloor, sandwiched between layers of a wood floor or attached beneath the subfloor. Often metal plates which act as fins to disperse the heat within the floor are used in wood floor applications. Radiant panels can be used effectively in combination with other forms of heat distribution including baseboard convectors and forced air. For example a home may have a heated concrete floor on the lower level and forced air on the upper level. Will radiant heat cause my wood flooring to warp? No, wood flooring is a very common, practical, and beautiful choice for a radiant floor system. 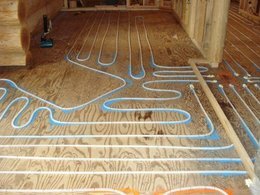 In fact, installing a wood floor over a radiant heat system is not much different from laying a typical wood floor. For solid wood flooring, strips 3 inches wide or less are recommended. Faux wood products generally are made to withstand lower heat, so be sure to check with your product manufacturer for radiant installation specifications. For this and many other reasons, good communication between all members of your installation team is essential. "Thermal Mass" refers to the ability of a material to retain heat. For instance, a heated stone will remain warm much longer than a block of wood. This is because the stone is denser thereby containing more mass. The mass of the earth can be used as a flywheel when it is heated under a radiant concrete slab. This storage of heat can carry a building through a time when energy is not available. Where "off-peak" electrical rates are offered, using a radiant floor in conjunction with the thermal storage of the earth beneath the slab can produce some very low electric bills. Thermal mass in a heated shop or hangar floor responds rapidly to the change of air temperature when a big overhead door is opened. All the heat that has been "trickled" into the slab over time is released quickly to combat the cold air rolling in over the floor. This happens because of the sudden, dramatic increase in temperature difference between the slab and the air. Once the door is closed the building returns to its normal comfort setting almost immediately. The key to any radiant panel system is to provide an even surface temperature so some mass is required to spread the heat across the panel. This mass may be in the form of a gypsum or other cementitious material or metal plates in the panel construction. Some underfloor systems simply rely on air currents within the joist space and the mass of the wood subfloor to spread the heat. When properly designed, these systems are a good alternative for retrofitting an existing building. Response time often refers to the time it takes for the system raise the room temperature when the thermostat setting is increased. This is not an accurate definition of response time and can lead one to a false conclusion that radiant systems can be slower than other heating systems. Response time should be measured by the amount of time it takes to make the occupant "comfortable". See "Temperature and Radiant Systems". In some cases, radiant systems can have a faster response time than other forms of heating. As a rule, wall and ceiling panels have far less mass than floor panels and therefore respond quickly to changes in the room environment. This is particularly true when recovering from setting back a thermostat at night or when returning from vacation. Floor systems are very stable and maintain a uniform climate because the floor surface remains at a constant temperature. Increasing your comfort and, at the same time, saving money on your utility bill is a winning combination. Multiple zoning to allow unused rooms to be turned down, and use of thermal mass for off peak storage can reduce energy bills. Another energy savings comes from lower overall thermostat settings which you choose naturally. When both air temperature and radiant transfer are compensated for, you feel comfortable at room air temperatures which are lower. You no longer have to force yourself to turn down the thermostat to save, you will do it automatically to be comfortable. Heat loss from any building is driven by the temperature difference between the inside of the structure and the outside. Conventional systems locate registers along outside walls, under windows and in front of sliding glass doors to compensate for all those cold surfaces. That hot air goes up those cold outside walls, across the ceiling and down to the cold air return. In other words, every place where heat loss occurs. This is a great setup for wasting energy. Radiant panels direct the heat to the interior of the space and reduce or eliminate the excessive temperatures on outside walls and ceilings. This can result in energy savings of 10% to 30% in most residences and up to 60% or more in shops, hangars and warehouses. Some radiant panel systems are capable of cooling by circulating cool water through the panel. All the principles of radiant transfer still apply. By providing a cool surface, all other surfaces, including our bodies, will give up heat to the panel. Just as in heating, this is extremely pleasant. Radiant panel cooling is most often done with ceiling panels although it can be accomplished using walls or floors. Floors become enjoyably cool, not cold. It is only when humidity is a factor that steps must be taken to avoid condensation on the panel. In this case, an auxiliary air-conditioning system is used to dry the air. Most often a separate air-conditioning system is installed. This could be a simplified central system or a split system with strategically placed units. The advantage is zoned cooling. Using zoned cooling and placing air registers in the ceiling (where they should be), will result in summer energy savings. Choose an installer who either has experience or has the proper training. Avoid those who appear to be flying by the seat of their pants. The industry has been around long enough that "design as you go" is not acceptable. The installer should have a room-by-room heat loss analysis of your building done as well as a step-by-step system sizing process. Many companies have these on computer and can provide you with a printout, although work done by hand is perfectly acceptable. Guesses and estimates are OK for preliminary work, but nothing replaces good planning. Look for members of the Radiant Panel Association, they have access to current information and educational materials. You will encounter objections. The construction trade does not like to do anything out of the ordinary. Anyone involved in the building or remodeling process who is not experienced with radiant panels is likely to balk. This is a normal, self preservation reaction encountered in architects, engineers, builders, plumbers, electricians, mechanical contractors and anyone else who has input into your project that might be affected. By their objection they are really saying, "I don't know enough about radiant panels and therefore do not feel comfortable working with them." Your choices are, either find someone else who does know radiant panels or educate the people you are working with. Working with professionals or trades people who are unfamiliar with the systems can result in inflated costs and a potentially poor installation. Have them contact the Radiant Panel Association for assistance. Remember, you are the one that will live or work in the building, not the contractors. It all comes back to your desire for comfort and energy savings. Do your homework, ask a lot of questions, use a reputable installer and you will end up with a level of comfort you may not have thought possible. People who have experienced radiant panel heating seldom, if every, return to conventional heating and cooling systems. Make the decision for radiant panel heating and you will not be disappointed. Contact Us Today Our team of experts is ready to talk about your project.